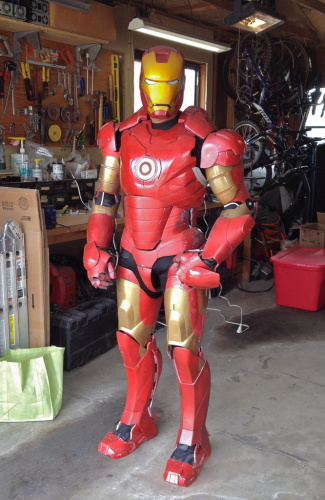 Our friend Jerome built an amazing Iron Man suit - check it out! Last week, one of our awesome customers Jerome sent us an amazing project he's been working on with a friend: an animatronic Iron Man suit of epic proportions. We got some details from Jerome - as well as a video of the suit in action, his build log and a tutorial on Instructables - and had to share it with you! The suit boasts a wireless helmet, shoulder rockets, forearm missile, hip pods, light-up boots and moving back flaps. It is powered by four Arduino microcontrollers, 20 servo motors, a digital sound board, and functions are activated by RFID tags in the gloves. Jerome also shared some background on the project with us. I've been working as a professional jeweler here in Boulder for the last 16 years, and before that I spent around 12 years working in the bicycle industry, primarily in R&D and design. I got into movie prop and costume building as a hobby around 10 years ago and I started incorporating electronics into my projects shortly thereafter. The challenge of actually being able to pull it off! There were definitely a few moments when I thought my friend Greg and I had maybe bit off a bit more than we could chew, but we were pretty determined to make it happen. A big motivator was there were a lot of people on the Replica Prop Forum that had been asking if I could help them animate their Iron Man helmets, so I really wanted to write a tutorial for that. Costuming and prop building is extremely popular right now and I think it's a fantastic vehicle for learning an enormous variety of skills and technologies - molding, casting, sewing, fabrication, electronics, mechanics and so forth. There is an awful lot of problem solving involved in costuming and prop building, and I enjoy getting people excited about learning new technology and hands-on craft skills. There is also a lot of positive support and encouragement in the costuming communities I frequent - that's a really great feedback loop for someone working on a project. How long did the project take to complete, and what materials did you use? The Iron Man project took nearly a year and a half of on-and-off work. We used a wide variety of materials: fiberglass, plywood, brass, music wire, and of course lots of electronics. The electronics side is comprised primarily of SparkFun Arduino Pro Minis (four of them), an Arduino Pro, two XBee radios, two ID12 RFID tag readers, a Sharp IR sensor and an Adafruit Wave Shield to handle the sound effects.There's also twenty Hitec servos and lots of LEDs. Always! Right now I'm working on a couple of animatronic Stargate projects that I'm really excited about. There's a couple more Predator projects for some friends as well. I've got some fun projects planned with my kids too. After that, who knows? I'm always up for a challenge. Nice work Jerome! You can find the build log for the Iron Man suit here, and the Instructables tutorial here. Watch Along with "Pure Data & Arduino"
OMG...MUST HAVE tutorial on wiring motor to helmet! PLSS! Very cool. The picture with the garage door in the background made me wonder what the neighbors must think when they drive by. -"Mommy I saw Iron Man in that garage!" -"I'm sure you did sweetie." Is that supposed to be the suit "boasts" instead of "boats"?